The Coen Brothers are back! And on Netflix - which is weird but alas, welcome to the new normal I suppose. Fans of the unmistakable eccentricities of a Coen Brothers movie will find plenty to like throughout this unique six-story anthology project. Authentic in look and feel, curious as to why this was a labor of love for the brothers, The Ballad of Buster Scruggs is definitely one of the more unique films of 2018. I mean, alright, but what is the overall point of this? While there are a few terrific performances in the film, the stories exist in isolation from one another and may not always be nearly as smart or engaging as the Coen Brothers want or believe them to be. Hyper violent, the film uses blood and strong violent images almost as a crutch, never fully cultivating much interest beyond the shock and awe of each garish wound and killing. The initial idea was a novel one: The Coen Brothers work in partnership with Annapurna Pictures’ new television division to create a six-story Western anthology series, with feature-length television episodes bringing to life Western-themed stories Joel and Ethan Coen have been writing and developing for a quarter of a century. As we arrive in November 2018, Annapurna’s television division has been to slow to come together and Netflix, earlier in the year, swooped in to keep the project alive. This past summer, it was announced that The Ballad of Buster Scruggs would become a six-story anthology film, not a television series, and debut on the Netflix platform in mid-November. Cinematic and ambitious, Joel and Ethan Coen tell six stories which literally come out of the pages of an old-fashioned storybook. As the pages turn before and after each segment, we are introduced to stories featuring dark, dry gallows humor, graphic violence, a bevy of good guys and bad guys, a young woman hopeful for a new beginning, a grizzled old prospector, and even a story which flirts with the supernatural. None of the stories are bound together, existing in isolation from one another. They range in length from approximately ten minutes to well over a half-hour. Each segment has strong violence, tell variations within the Western genre, but never find a connection in tone or theme. This is essentially six distinctive Coen Brothers mini-Westerns, and for some, that will be more than enough reason to login to Netflix, grab microwave popcorn, and sit back and see what the brothers have in store of all of us. 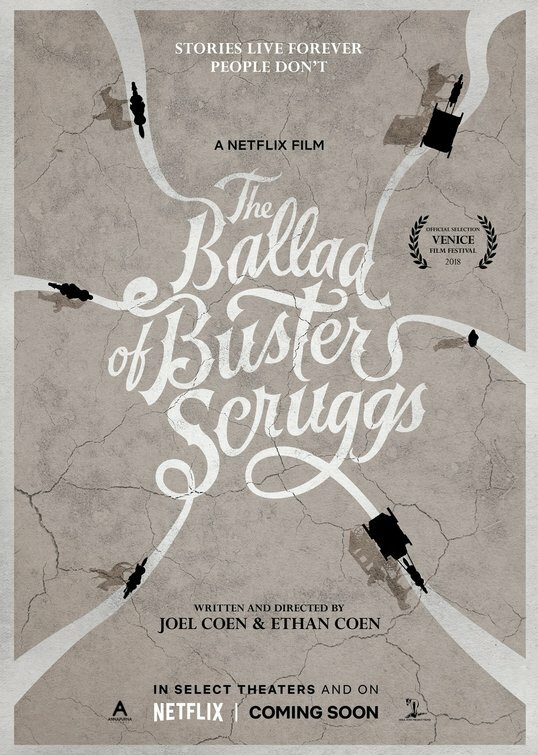 In The Ballad of Buster Scruggs, the titular Buster (Tim Blake Nelson) is a singing cowboy who opens the film with a song, even playing guitar on a horse. He speaks directly to the camera, we sense he may be the film’s narrator or omnipresent figure, but we soon realize that he is a deadly accurate shot, is absolutely not a misanthrope, and will soon have more than one shootout in the center of a dusty old town before his chapter comes to a close. James Franco appears in Near Algodones, as a traveling bank robber whose foibles lead to him being bound to a noose, only to have an ambush of his captors allow him to survive, only to then get captured a second time and brought to the gallows once again. Meal Ticket follows, which is a rather ugly story of exploitation starring Liam Neeson as a traveling sideshow presenter, showcasing an armless and legless actor (Henry Melling) performing his one-man show. Tom Waits steals the show in All Gold Canyon, playing a lonely prospector who digs and digs for gold with little to no avail. The longest segment of the film is The Gal Who Got Rattled, starring Zoe Kazan as a young woman traveling to Oregon following the death of her brother, only to then strike up an unlikely relationship with a traveling companion (Bill Heck) before a fateful encounter halts her journey. The Mortal Remains finds three European men and one unassuming and chatty trapper (Chelcie Ross) traveling in a carriage with an unnamed woman (Tyne Daly) which proves to be a more menacing experience than the trapper could ever hope to realize. In all instances, the performances are solid but the Coen Brothers seem to be wrestling with ideas and concepts, more than developing actual stories. At times, the movie feels like it keeps wriggling out of their grasp. Prone to meandering, this compendium of stories is largely hit or miss, and sometimes those moments exist within the same story. When Buster Scruggs sings and talks directly to us, by the time Franco’s bank robber draws a gun on a bank teller (Stephen Root), we are left to wonder what the point of the first story happened to be. As Franco’s fate is revealed and Neeson sets up his stage for his “attraction,” we are even more removed from the story before it and so on and so on. Death proves to be a common theme, as does hopelessness, despair, sadness, and regret. Because the stories revel in a perpetual emotional darkness and vacancy, moments of humor and/or levity increasingly feel lackluster and empty. And yet, dismissing this film is a bit unfair. Typical for the Coen Brothers, they craft some striking and stunning elements which are hard to ignore. Amidst the storm cloud of dread hanging over each segment, Kazan crafts an engaging and impressionable young woman we cannot help but root for. Jonjo O’Neill shines as an English businessman whose story of “The Midnight Caller” turns a carriage ride into something similar to a Gene Wilder/Willy Wonka-like experience. Nelson is having the time of his life in the opening segment, while Waits is, once again, simply fantastic. Ultimately, the question becomes is there enough here to enjoy. Can you overlook the bleak tone of the stories and embrace the great work from the expansive cast. How much is too much, or do you simply find yourself wanting more of all of this? Rich in symbolism and beautifully shot by Bruno Delbonnel, The Ballad of Buster Scruggs is a film that feels like an experiment that runs its course well before the final segment arrives. With that said, fans of the Coen Brothers will find plenty of moments to swoon over, even if you contemplate what might have been had a television series been the final outcome. Starring: Tim Blake Nelson, David Krumholtz, Clancy Brown, James Franco, Stephen Root, Ralph Ineson, Liam Neeson, Henry Melling, Tom Waits, Zoe Kazan, Bill Heck, Grainger Hines, Tyne Daly, Brendan Gleeson, Jonjo O’Neill, Saul Rubinek, Chelcie Ross.